How to create Mail merge with Gmail and Google docs? Mail merge is a very interesting feature in every mail. And, being as popular as it is gmail supports this. So, What is Mail merge? Imagine you have a mail that needs to be sent to 50 of your friends/clients. One thing you can do is to add all the mail id's in the 'TO' field and send it. This sure is one way to do it, but if you want to send a personalized message to each of them, probably something like, Hello Mr.A, for friend A and Hello Mr.B for B and so on. To be able to do this, you need to send the mails individually. Wouldn't it be easier if you can send this to all the persons at once? Behold the Mail Merge man. He will make this task simple and easy. You just need to write a single mail and that will be sent to each of them with the corresponding personalization. So, How to Mail Merge? 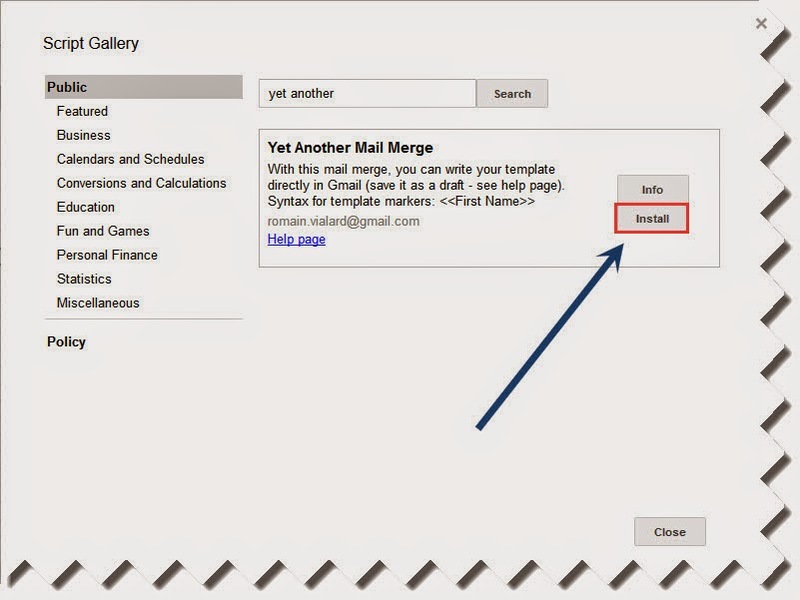 Using mail merge is very simple and easy. There are only a few steps you need to take care of and the job is done. Open a blank spread sheet and enter the details and Email addresses of your friends like shown below. 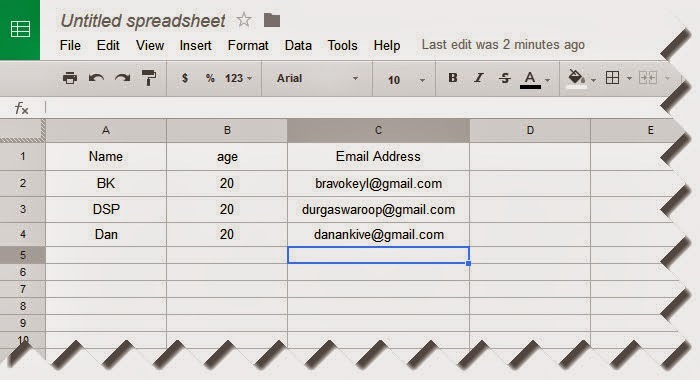 (You can create a spread sheet by going to Google drive and clicking on that red "CREATE"
button) Here I am sending mails to two of my friends and to myself as well. So, on the whole I am sending 3 mails. You can use the same to send 30 or 300 mails. But, one thing you need to take care of is that, the name of the column with their email addresses should be named, "Email Address" and nothing else. The Mail merge man, sends the mails basing on these mail id's. So, the column name should be the same. 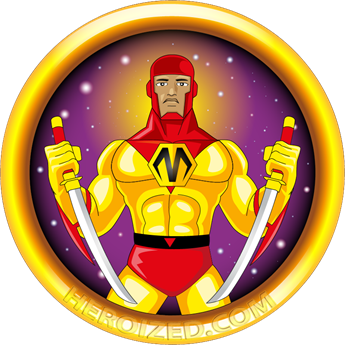 .Then click on the TOOLS and SCRIPT GALLERY and search "yet another". 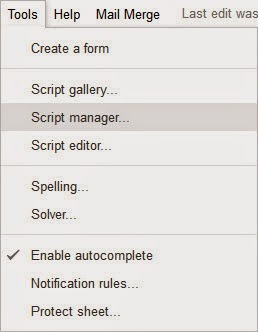 You should get script like shown in the image below. Click on install . It will ask for authorisation, click 'Continue'. (No need to worry. This is perfectly safe). After you gave the permission, close it. So, you see something weird here, what is all the '$' signs and '%' signs? "Name" and "age", used in the mail surrounded by the $ and %, will fetch the data from the respective columns of our Spreadsheet. (Note that, the column names in the spread sheet are to be used. Here they are 'Name' and 'age'). Hope you are doing well. You age is 20. Isn't it? So, Do you see what happened here? The '$%Name%' gets replaced by what ever is there in the "Name" column and similarly '$%age%' will get replaced by the corresponding value in the "age" column. Similarly the text in the Subject will also, be changed accordingly. So, now after you have composed the message, go back to the spread sheet. You should be able to see a new menu in the top called, "Mail Merge". If you don't, you probably didn't follow step-2 correctly. Do it once more if required. Now, click on the Mail Merge menu and click on Standard Merge in the dropdown menu and you'll get a window as shown. 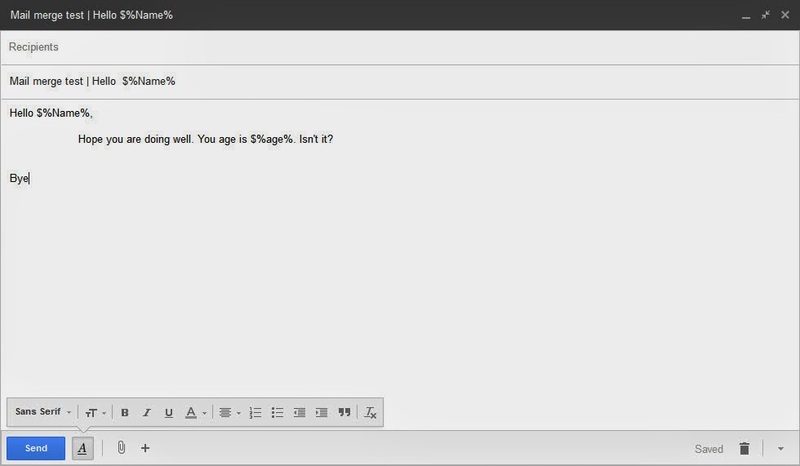 In that, select the current mail basing on the text you've written in the subject. Also, choose the name. This will be the name that will appear to the receivers in the 'From' section. After you did all that, click Send Mails and it will send the mails. If everything went well, a new column should appear in your spread sheet, named Merge status, saying Done. 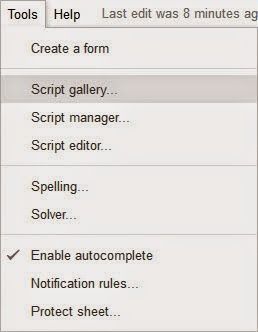 2.Click Edit in the dialogue box that opens. 3.That will open up a new window which will look something like this. 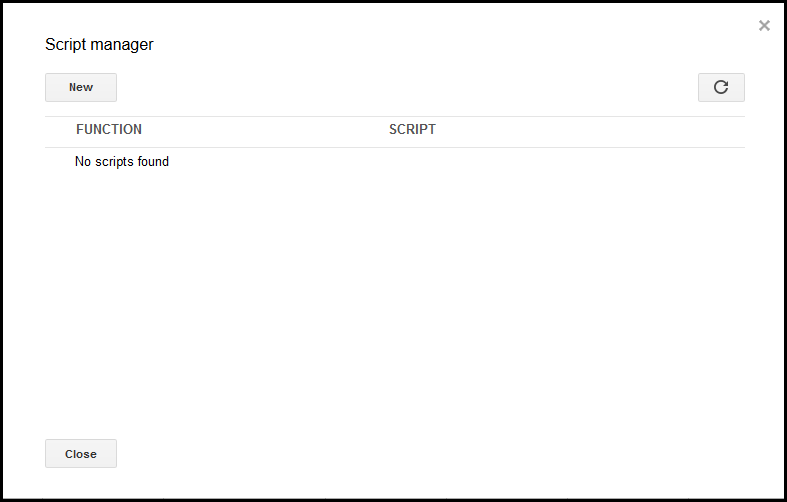 Click on Delete in the File menu. 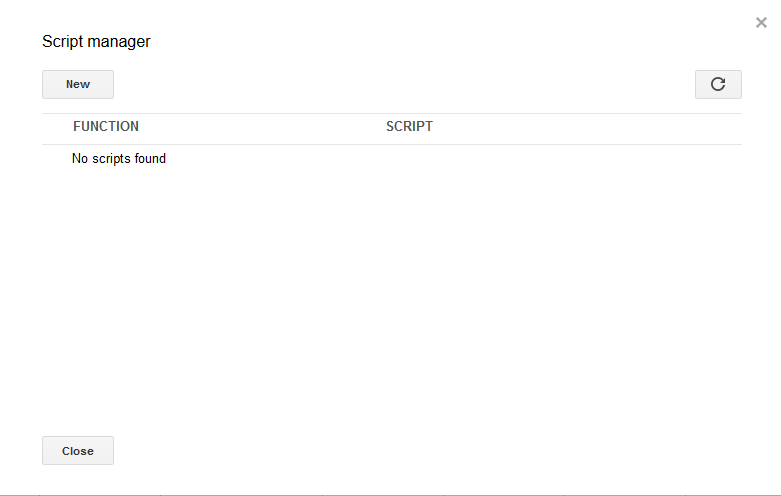 4.Now if you go back to the Script Manager dialogue box and click on reload, it should show up empty like this. 5. 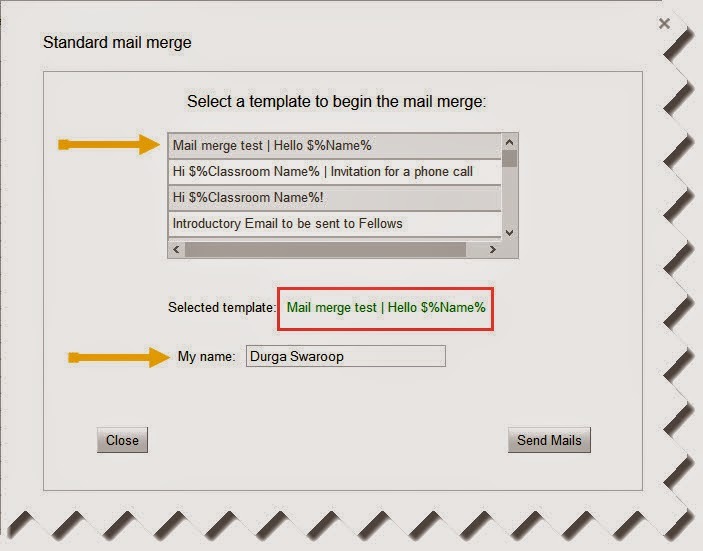 After that you can proceed with adding a new mail merge by following the steps 1 through 4 as mentioned in the top. So, yeah, That is how you use Mail merge to simplify your task of sending multiple mails. If you liked this article, you'll also like out other articles. So,take a look at them too.